One of my favorite songs is “In a Big Country” by the band Big Country. I want to live and breathe and see the sun in wintertime, as the song goes. Sure, I had an amazing time hiking in the snow in North Carolina on my girl’s trip in January, but exactly 2 days was enough of that. It has quickly become my favorite tradition to go somewhere in the Southwest in winter. So continuing down memory lane of our California trip, we’ll now visit some of my favorite scenery- the desert. 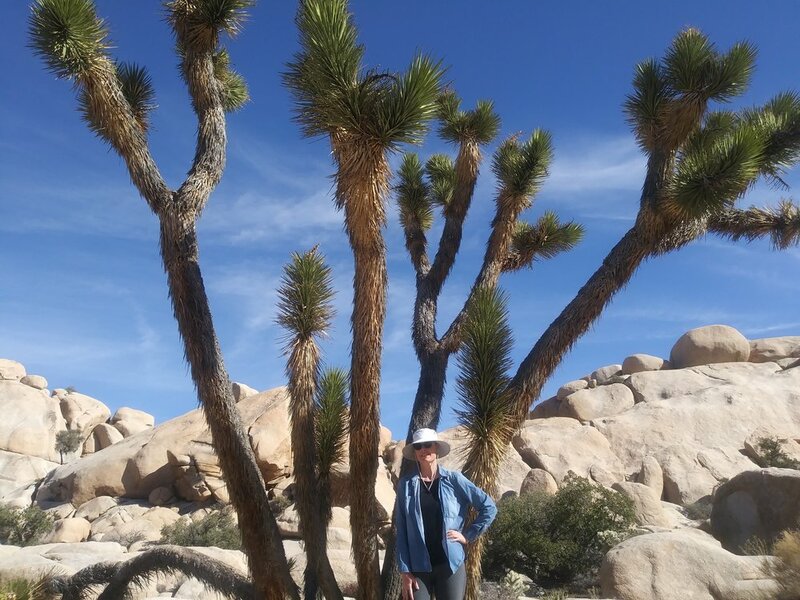 We set the bar high last year when we went to Joshua Tree, but Anza-Borrego Desert State Park had been on my radar for a long time and it definitely lived up to my expectations. We spent one day in Anza-Borrego and only saw a fraction of it. I’m pretty sure we didn’t even see the coolest spots, but that just means I have to go back one day with a 4-wheel drive vehicle. I planned the Anza-Borrego trip by browsing Modern Hiker, which is my go-to West Coast hiking website. It’s very easy to find great hikes of any distance, difficulty, or location through their site. We started out the day doing a short hike at Palm Canyon, which is easily accessible and just outside of town. 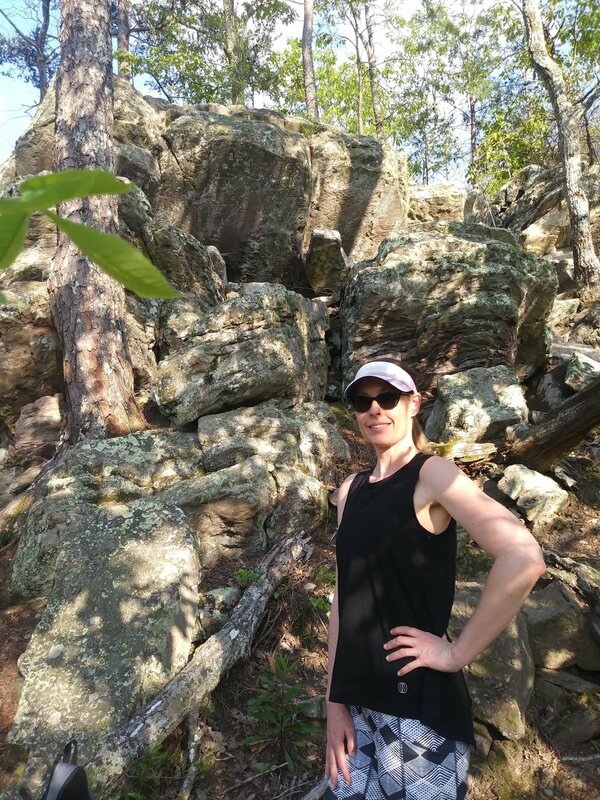 Since I was sick, I didn’t want to do any long or strenuous hikes. Palm Canyon was perfectly easy, yet showed off all kinds of scenery ranging from mountains to the namesake palm oasis. There was even lots of water flowing through due to all the recent rain! We were a little early for any “superbloom” type flowers but we did see a few wildflowers popping up. I was most excited to see bighorn sheep tracks near a stream and spent the rest of the day on the lookout for any actual animals (more on that later!). Although the hike was short, at just around 3 miles total, it took us longer than I expected because I’m always slower hiking in sand. After Palm Canyon, we drove into Borrego Springs to look around the town. Well, there is not much in Borrego Springs. A few roadside motels, a really nice library, and that’s about it…besides the sculptures, of course! 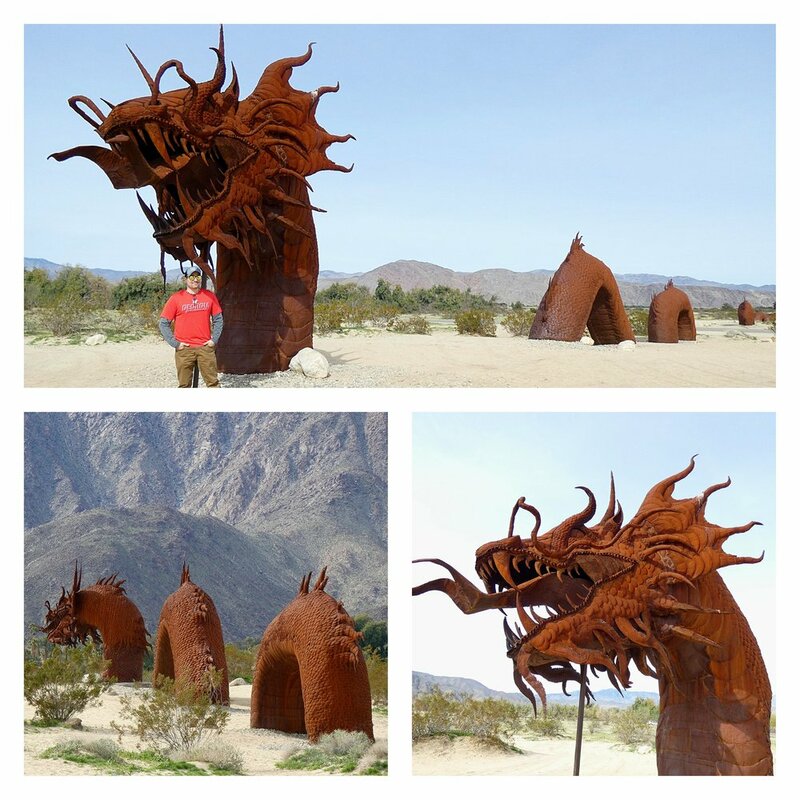 If you’ve been on Instagram in the past few years, you’ve probably seen pictures of all the metal animal sculptures placed all over Borrego Springs. It’s actually a really cool idea. The sculptor, Richard Brecedo, is very talented and it’s free to see the sculptures. So we drove around town for a while, driving across the desert searching for sculptures. I believe there are 150 of them, so needless to say, we didn’t see them all. James had a lot of fun posing with them though! I wanted to hike some more, but it was getting late in the afternoon so we chose another short trail- Culp Valley. The trailhead is actually at a much higher point above Borrego Springs and we had driven past it on our way into the valley. Since it was a higher elevation and getting late in the day, I was hoping we might see some animals…and we did! 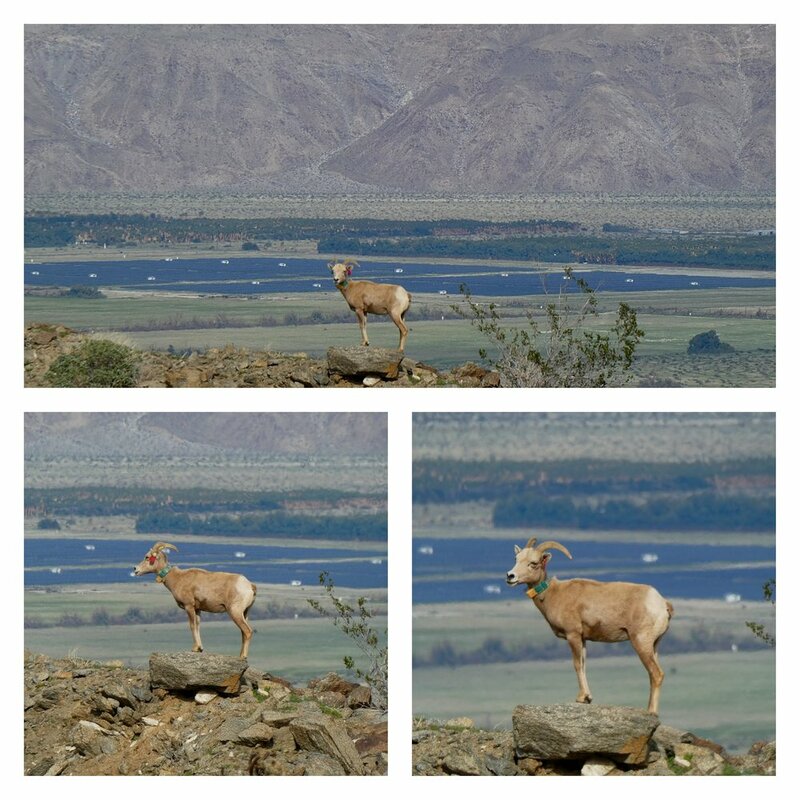 Sure enough, as we drove back up the mountain pass we saw about 6-7 bighorn sheep perched on the sides of the cliffs. Fortunately, there was a pull-off nearby and I was able to take some pictures. The sheep were so cute and seemed completely unfazed by me. One even seemed like it was posing for me. Of course, I was a very healthy distance away since the sheep were towering over me on the rocks above! At Culp Valley, we got a little lost. Well, not really lost, but it is supposed to be a loop and we didn’t really see where the trail continued to form a loop. We just walked down to an overlook point and then turned around. It was still a nice little hike with a beautiful view. It also felt more secluded than the Palm Canyon, where we saw lots of other hikers. And since the elevation was a lot higher, the scenery was just different. That is what I love about hiking in California. 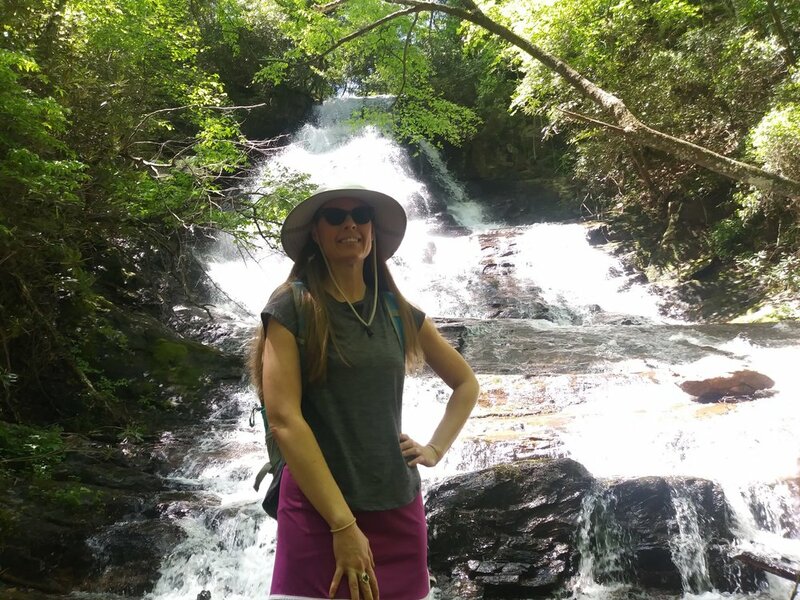 The elevation can change drastically in just a few miles and thus, you can see all kinds of different scenery in a very short period of time. James had a unfortunate run-in with a cholla cactus at Culp Valley, which kind of put a damper on our hiking and he was about done at that point. So we called it a day and headed back into San Diego in the early evening. It’s a beautiful drive between San Diego and Anza-Borrego, so the trip in and of itself was just as worthwhile. The next day, the weather turned bad in San Diego so we took it easy and started to just wind down our trip. 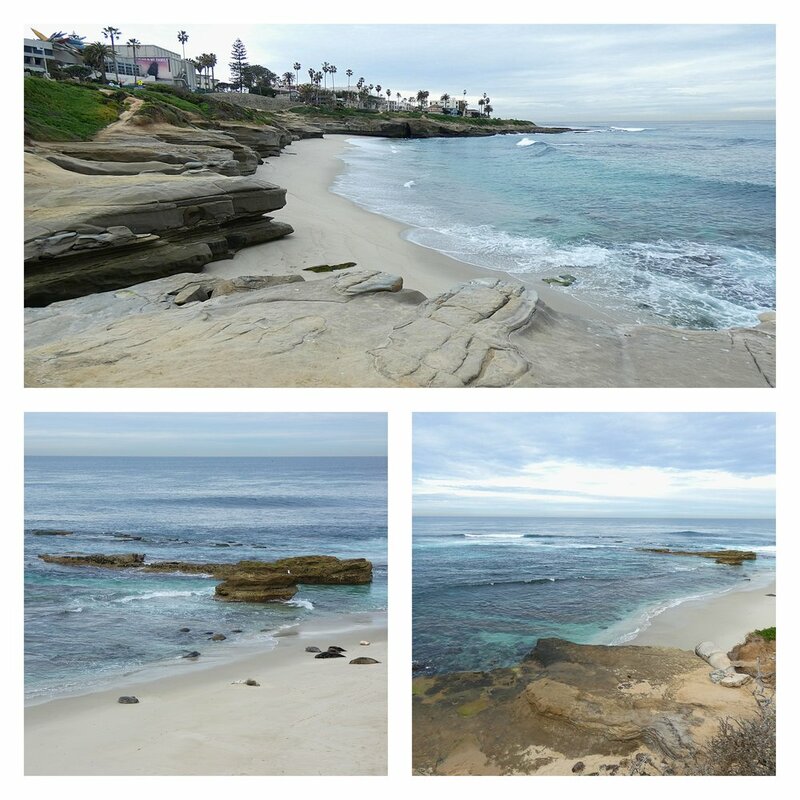 We managed to get out to La Jolla before it started raining and we saw lots of seals and sea lions. 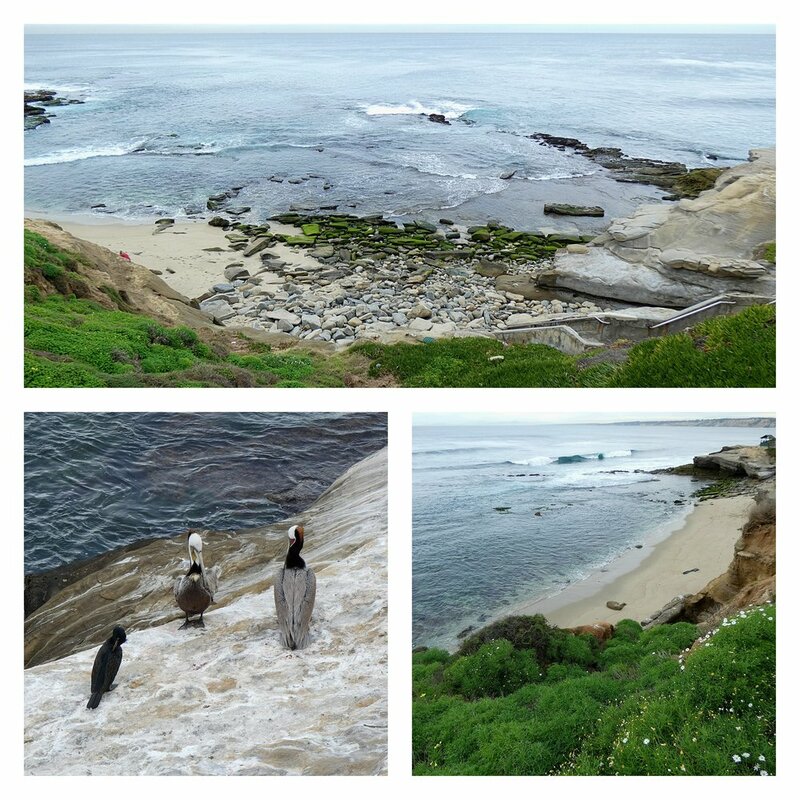 We’ve been to La Jolla 4 times total and yet, this was the first time we saw any sea lions. They are hilarious, basically just like giant sea puppies! Some of them came up on the sidewalk and had cones placed around them to keep bystanders away. It’s clear who runs this town! 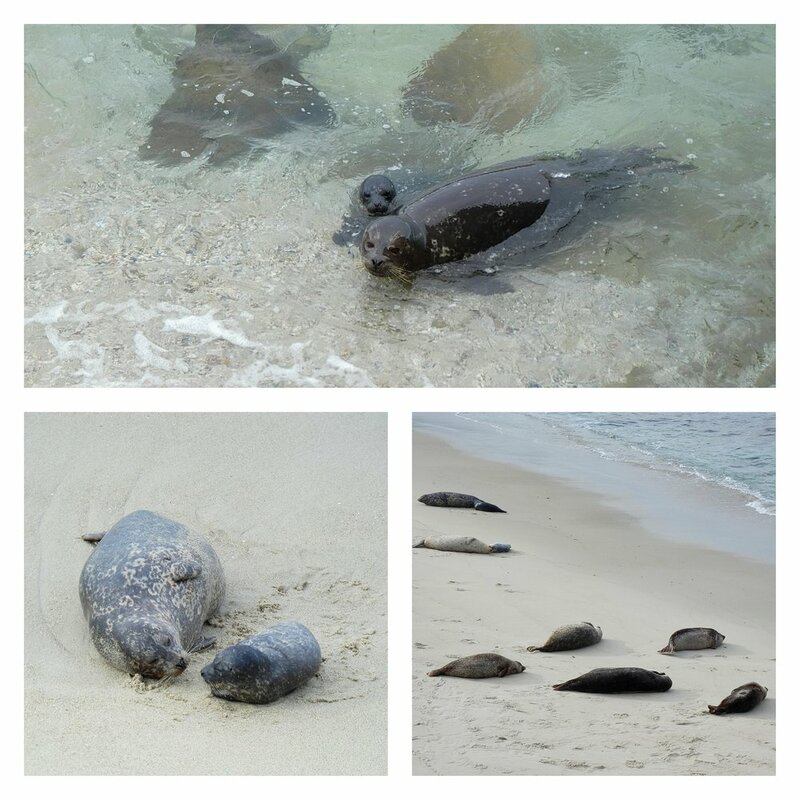 Winter is also pupping season, so we got to see several mom and baby pairs. It was a rather dismal, cold day so we didn’t stay at the beach too long. So, as the other song lyrics go, “it never rains in Southern California…it pours, man, it pours” and that apparently is 100% truth. We met up with a friend for dinner after La Jolla and nearly got washed away. I have not seen such torrential rain in a long time. It rains in Georgia all the time, but it’s usually light, misty rain that just never seems to completely go away. It also seems San Diego does not have adequate drainage systems either (would not stop me from moving there), as the streets and sidewalks flooded immediately. Since I was already sick, venturing out in the rain didn’t seem like a great idea, however, my internet search of “things to do in San Diego when it’s raining” did not turn up many ideas. Our last full day in San Diego, we tried to go to the Timpken Museum at Balboa Park which proved to be a bad idea. Of course, you can’t really park right near anything at Balboa Park so we walked across the park in the rain. Once we got inside the museum, James immediately seemed to have a allergic reaction, apparently from musty/dusty/old art. It was very unusual, but we left after that and drove back to Ocean Beach in the rain. Did I mention no one in San Diego can drive in the rain either?? After that, I was pretty much done for the day so I (sadly) packed up our stuff and laid around the Air BnB until dinner time. So we basically spent the last few days of our trip eating a lot, since there wasn’t much else to do. But the food in San Diego is amazing (my food photography, not so much). We went back to a few favorite places during this trip, like Plant Power and Apple Alley. But we also discovered some great new restaurants, like the OB Garden Cafe and Anthem (which unfortunately closed this week actually). We also went to a really great spot in North Park called Grains (this was during the torrential downpour, so we were literally the only people there). San Diego can really do vegan food! 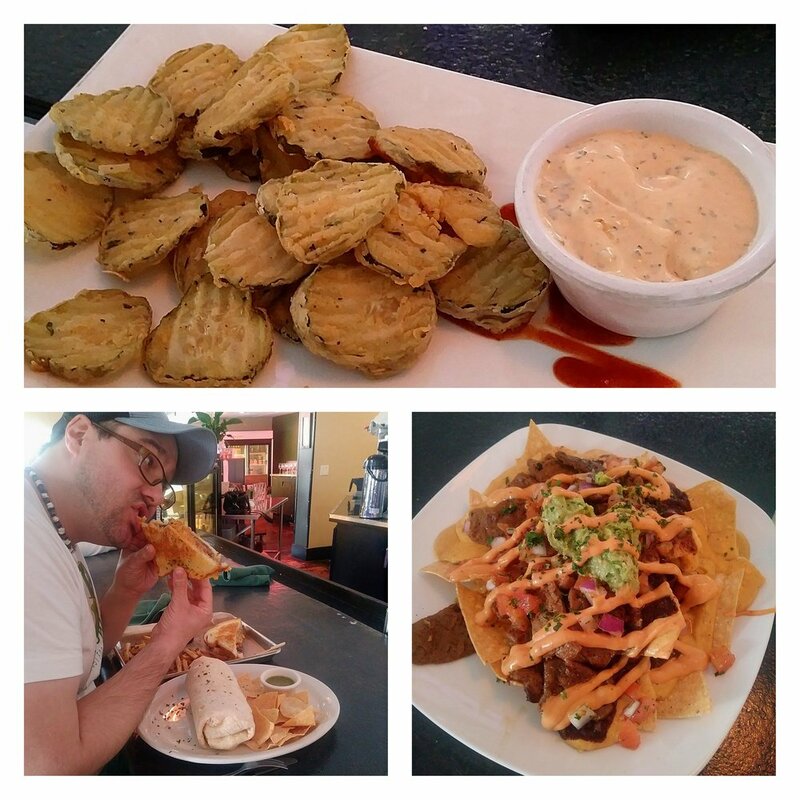 We tend to go to the same places over and over again (Plant Power, cough cough), so I still have a list of other vegan places we need to try on our next trip. And lastly, I do want to highlight our amazing AirBnB. 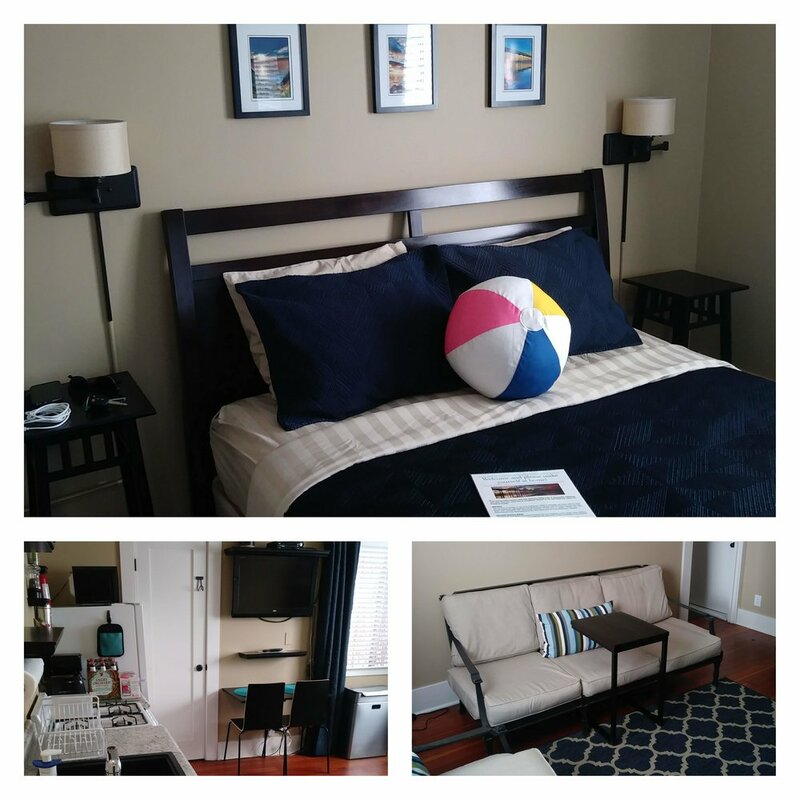 Whether you are for or against short-term vacation rentals, we love staying in local neighborhoods and really feeling like we belong. So when I saw this adorable cottage listed for a reasonable price, I knew I had to stay there. The owner lives on site, although we had a totally private suite to ourselves. We enjoyed the quiet neighborhood, a private patio, and just enough space for us to relax and feel at home. Unfortunately, each time I visit San Diego I feel more and more attached. It really is becoming a second home for us. I just wish we were millionaires with more time off work, so we could truly have a bi-coastal lifestyle! But for now, we’ll have to settle for our yearly trips, keep in touch with our friends, and think back on the desert while hiking the mountains of North Georgia.